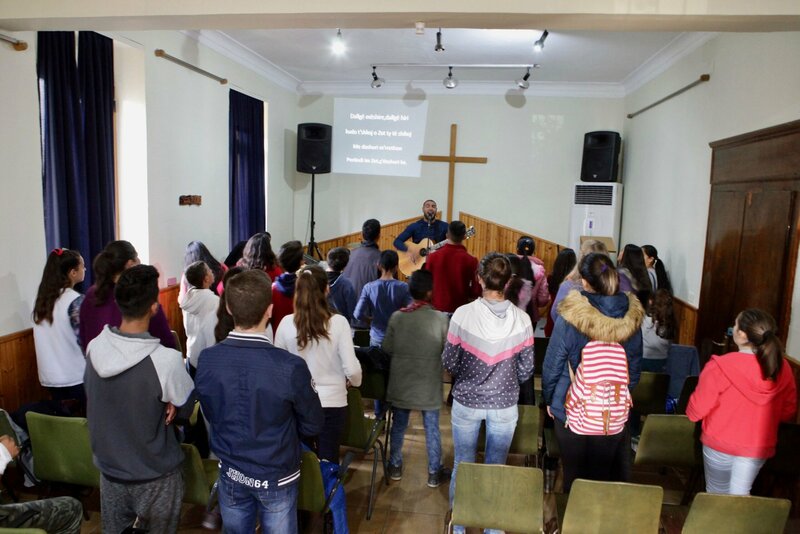 Suela, an Albanian OMer, had no idea what impact she would make when, in 2016, she and her husband began attending a small church plant in a suburb of Tirana. One Sunday after a church service, Suela had a conversation with 17-year-old Melisa, a girl born and raised in the area. Although from a nominal, traditional religious family, Melisa became a Christian as a young girl, having heard the gospel through the kids’ ministry at this local church. As it was Melisa’s last year of high school, Suela asked her about her future plans. However, Melisa was curious to know about Suela’s missionary life! So Suela shared about her experiences on the OM ship, Doulos. Little did Suela know that a fruitful seed had been planted and that Melisa would go home and look into ministry opportunities, including on the OM ship, Logos Hope. Melisa discovered that this newest OM ship sailed to different port cities around the world, supplying educational and Christian literature, training young people on board and reaching out to nations in practical ways, sharing God’s message of love. In the summer of 2017, Melisa had the opportunity to go to TeenStreet Europe – Balkan in Montenegro, where young people were challenged about what role they were playing in their lives. Melisa confided in Suela that her heartfelt desire was to grow spiritually and to be involved with ministry. Suela prayed with this searching young lady, advising Melisa to ask God what was on His heart. Melisa, however, believed that this was from God, and the Lord proved Himself faithful, bringing everything together for her. The application process went quickly. God even miraculously provided all her financial support within one month! Suela experienced unforgettable joy in seeing 19-year-old Melisa go to Logos Hope, as well as witnessing their small church sending out their first missionary by sacrificially supporting her. Due to pain in her joints, Melisa changed roles and is now working in the people development office, where she is taking over the children's ministry job. Besides being involved with different events on board in every port, Melisa has also joined with a prayer group on Logos Hope called Extraordinary Prayer. Melisa gets together with others in early hours of the day or at break times from work to pray for a nation the Holy Spirit puts on their hearts. Although Albania is economically one of the poorest countries in Europe, there are rich testimonies coming from this incredible country. Pray that Albania will become more and more a sending nation—sending out Albanians, like Suela and Melisa, eager to spread the good news! Melisa, who is one of four sisters, has a strong desire to see her family walk close to God. She shares God stories with them about her time on board, and they are open to listen and curious to know more. Praise God that one of Melisa’s family members has given their life to Christ since Melisa joined the ship! Please pray for all in her family to have open hearts to Jesus. Pray that Melisa would continue to grow spiritually and be strong in faith and in good health. Pray for Melisa as she continues in her role in leading children’s ministry.